L eading from experiences with our successful joint venture to bring forward the Fletton Quays development, my pro-active administration decided last year to create Medesham Homes, a specifically housing-focused joint venture between the city council and Cross Keys Homes, with an agreed objective of delivering new housing of all types and tenures. This will shift the council’s role from ‘enabler’ to a direct developer of housing. A £20m capital budget was set aside as potential funding for the council to invest in the joint venture project and £14.6m of corporate affordable housing capital funding has been allocated specifically to support affordable housing provision in projects that Medesham Homes will bring forward in Peterborough. I’m now pleased to report that several substantial housing projects are on the cusp of being agreed and you’ll be hearing more in the coming weeks. Last year was another very successful house building year for Peterborough achieving the highest growth rate in the UK, and with this latest venture I am keen to be able to directly affect and increase the amount of affordable, high quality homes we desperately need in our growing city. With ongoing growth comes the additional need for our front-line services to perform effectively, in the face of the unprecedented Government funding cuts our council continues to endure. Despite having to cope with diminishing resources I am particularly keen to keep our city’s streets as clean as possible and reduce anti-social behaviour (ASB and petty crime. I understand we have a commitment to the tax-paying residents of Peterborough and our recently introduced SaferPeterborough Prevention and Enforcement Service - or PES - has already made a significant impact within these unacceptable areas of city life. From the outset the PES team strategy was never about just issuing more tickets and fines, it’s designed for our officers to work more effectively and efficiently and have a much higher profile and subsequent deterrent aspect. Prior to the coming together of the service, our response was often fractured and did not fully exploit available powers. We now have a cohesive multi-tasking team who employ all available powers and more effectively deal with illegal activity of all types and, I have to say, the positive feedback received from the public and business sectors has been extraordinary. Total number of cases dealt with by the service since April 2016 are also quite remarkable, with nearly 700 ASB cases, 65 unauthorised encampments removed, over 1000 rubbish accumulations and many social and housing-related problems tackled successfully. Not to mention the 21 Penalty Charge Notices issued last week to people caught cycling on Bridge Street. With the city’s housing in mind I’m also pleased to mention our Selective Licensing programme is now embedded in defined areas and evidence tells me it’s working very well. We’ve handled 6,184 applications so far and nearly 1000 properties have been inspected since the launch, which is very good progress indeed. 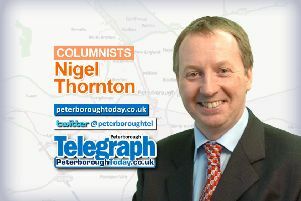 This programme, as we’ve said from the outset, is very much geared to making some areas of Peterborough better places to live and work by eradicating poor-quality rented housing and dealing more effectively and swiftly with rogue landlords. As a Local Authority we’ve had to completely re-think over the last seven years the way we deliver our services to you, the council taxpayers. Never a council to stand still we’ve devised innovative solutions to the myriad of challenges we’ve faced and continuously worked with our internal and external partners to find the answers. I’m proud of my team of officers and senior members and what we’ve achieved but be assured I will continue to encourage them to find better ways of improving what we do for residents and visitors.